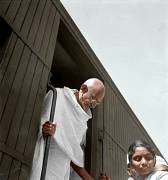 Mahatma Gandhi in train on way to Simla, June 23, 1945. Right: Ramkrishna Bajaj. 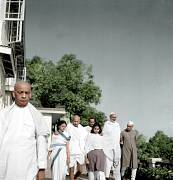 Mahatma Gandhi after the meeting with the British Viceroy at Simla, June 24, 1945. 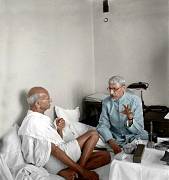 Mahatma Gandhi discussing Lord Wavell's proposals with C. Rajagopalachari, Bombay, June 21, 1945. Mahatma Gandhi discussing proposals with Maulana Azad at Birla House, Bombay, June 21, 1945. 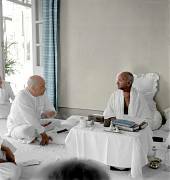 Mahatma Gandhi discussing proposals with Sardar Patel at Birla House, Bombay, June 21, 1945. 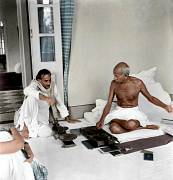 Mahatma Gandhi discussing proposals with Acharya Kripalani at Birla House, Bombay, June 21, 1945. Manilal Gandhi with others at Simla, July 1945. Mahatma Gandhi alighting from his 3rd Class Special Compartment, January 8, 1946. Mahatma Gandhi during his visit of political prisoners at Dum Dum Jail, Calcutta, January 17, 1946. A British parlamentary delegation meets Mahatma Gandhi at Madras, January 23, 1946. Mahatma Gandhi collecting donations for Harijan Fund in South India, January 1946. Mahatma Gandhi with his secretary Pyarelal reading, Harijan Colony, Delhi, April 1946. 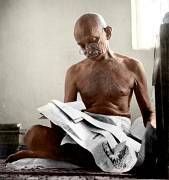 Mahatma Gandhi reading, as he sits next to a spinning wheel, Harijan Colony, Delhi, April 1946. Mahatma Gandhi reading, Harijan Colony, Delhi, April 1946.